This year's Jr. Race to the Sky was quite the experience! This was my third year running the race and it was by far the most memorable. 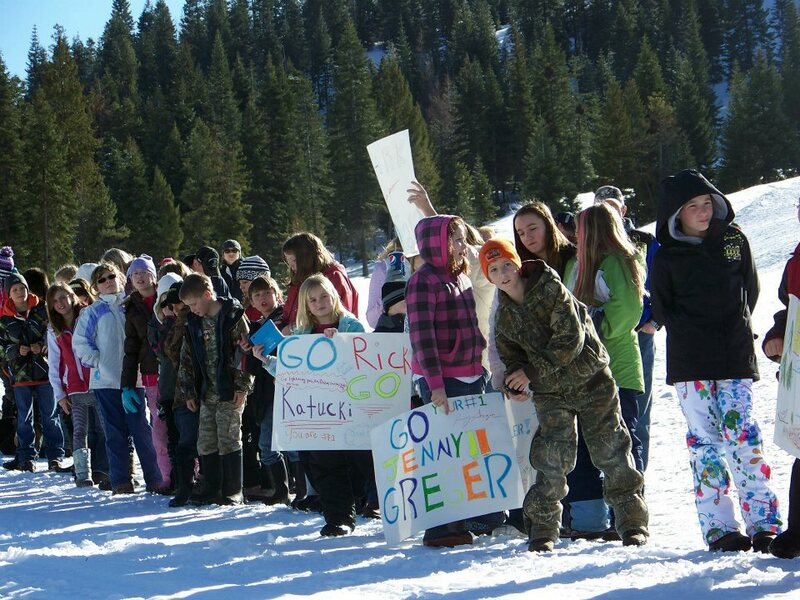 This year there were 5 junior mushers along with an additional adult 100 mile, 8-dog class. 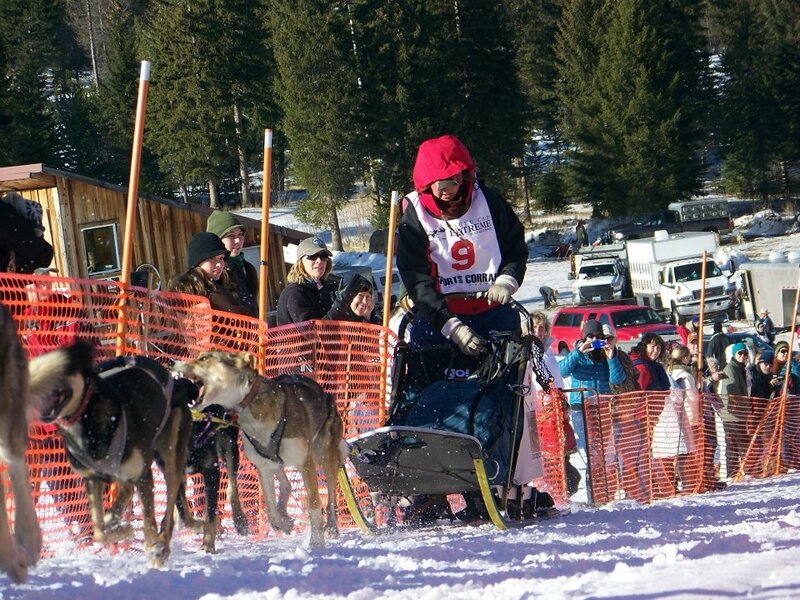 Three of us juniors were also going to compete in the Junior Iditarod later that month. The race started out fairly normal. My handlers; Gary, Spencer, and Erika; got me out onto the trail Sunday afternoon and met me at the Whitetail checkpoint after my team and I traveled the first leg of the race which included charging up Huckleberry pass. Once into the checkpoint, which I was the first 8-dog team in to, I began working on getting the dogs settled into their 6 hour mandatory layover. My handlers Erika and Spencer had all my equipment ready there at the checkpoint, so I was able to quickly get my team fed, jacketed, massaged, and bedded down. 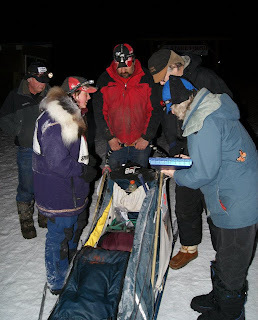 I then headed into the lodge to get some food and sleep for myself and check on what time I could leave the checkpoint. This is the point I realized that this race was going to get interesting. Alea, Bailey, and I were scheduled to leave all around the same time for a mad-dash to the finish line. Because the first 7 miles out of Whitetail were going to be on the icy and gravelly road, I decided to change-up my team line-up. I started out the race with Bella and Alice in lead, my most driven and focused leaders, with Emmett and Jasper in swing, Khufu and Cessena in team, and Ra and Kaycee in wheel. However, Bella had a little bit of and issue with coming to a complete halt when she needs to take a dump. What follows after her sudden stop somewhat resembles and accordion and requires good snow-pack for me to set an anchor hook into to get off the sled and untangle the mess. To solve this problem, I switched around Khufu and Bella. Even though Khufu is sometimes a little unfocused, he was on fire and driving super hard. Bailey's team and I were leapfrogging back and forth down this road as we chased after Alea. After 7 miles on this road, we got back up on the snowmobile trail and were all three in a row. I was able to stay in the front of our little procession for most of the run, at times being able to break away from the others, but only for a brief amount of time. 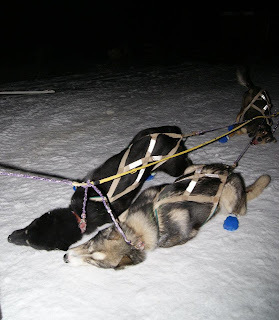 Mine and Bailey's team also did a lot of time running side by side down the trail while we carried on a conversation. 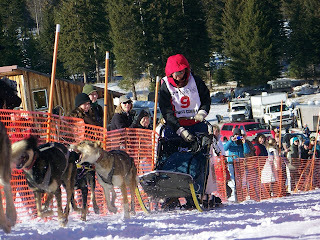 Though we were all very competitive and the race was really tight, it almost felt just like 3 friends going out on a fun run with their sled dog teams. Because I was very familiar with the trail, I was running that last leg of the race with my headlamp off pretty much the whole time. The dogs didn't need it to see, and we all knew where the trail was. I did this so that Alea and Bailey behind me would hopefully have a harder time following me and keeping their teams right on my heels. It's also nice to just run by moonlight too though (: When we got to the last 10 miles of the race, I was finally able to put some distance between myself and Bailey and Alea. I knew it was a slim lead though so I was spending more time looking over my shoulder than down the trail. I took this opportunity to put Bella back in lead since I now needed my reliable girls up front. We raced closer and closer to the finish and I was still maintaining my lead though I would occasionally catch the glimpse of a headlamp behind me just as I rounded a corner. I made another stop just before the trail opened up next to a lake. Here I turned of the red pulsating light on Alice's collar and my headlamp, for this part of the trail was open enough to be able to see a mile down it and I didn't want Bailey and Alea to know just how close they were to me. I was only about a mile in front of them when I could see their headlamps beaming down the trail towards me and I crouched down as my team silently raced through the darkness. We made it back into the trees and bends without being spotted and ran into the early morning fog of Seeley Lake. This forced me to turn on my headlamp and the red light on Alice again. Passing the end of the Seeley Airport runway I could stop holding my breath because the finish line was just seconds away and there were no headlamps behind me. It was a close race, but I crossed the finish line first at 6:20am on Monday, winning my second Jr. Race to the Sky. Alea finished 3 minutes behind me, and Bailey came in third only 2 minutes behind Alea. Aiyana finished in 4th, finishing before the first place adult team even though the adults started the race before the juniors. All my dogs did awesome and were looking good at the finish. The physical part of the race was no big deal for them, but to have 2 teams drafting of them for 50 miles was quite the workout, but they did it. I knew they were ready for the Jr. Iditarod. 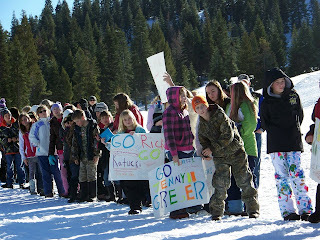 Photos from the race can be viewed HERE. It has been a long time since I have sat down and done one of these, and so much has happened in the meantime. So, I am going to try and catch everyone up on what's been going on. Here are some pictures of puppy training runs with the 8 puppies, who will all be turning one year old this summer.